Fiat India the Indian arm of Italian car maker Fiat today launched the Abarth 595 Competizione in Indian car market with starting price of Rs. 29.85 lakh (ex-showroom price, New Delhi). During the launching event car maker also showcased Punto Abarth hatchback which is expected to make its debut sometimes during the up-coming festive season. The new 595 Competizione is the first offering by car maker to carry the badge of “Abarth” blowing the siren of establishing the roots of this best performing icon in Indian car market. Developed on the platform its predecessor Fiat 500, the new 595 Competizion is the perfect blend of retro architecture merged with contemporary features giving it a unique look. Empowered with 1.4 litre turbocharged T-Jet four cylinder petrol engine carried from Linea, boosting the power of 158 bhp and torque of 230 Nm. An interesting feature of this hatchback is that it can be driven on both sports and normal mode. While driving it at sports mode it will generate the above mentioned power and torque figures whereas when driving it on normal mode it will generate the torque of 206 Nm. It would be interested to know that in Indian car market it has been offered with five speed automated manual transmission system known as MTA, whereas in global market it has been offered with five speed manual gear transmission system. Major features offered in new Fiat Abarth 595 Competizione which gives it a sportier look are aluminum pedals, bespoke floor mats, automatic aluminum fuel and oil filling option, footrest and door kick plates and many more. Apart from this it also receives 17 inch five spoke diamond alloy wheels, along with cross drilled disc brakes and red brake calipers. 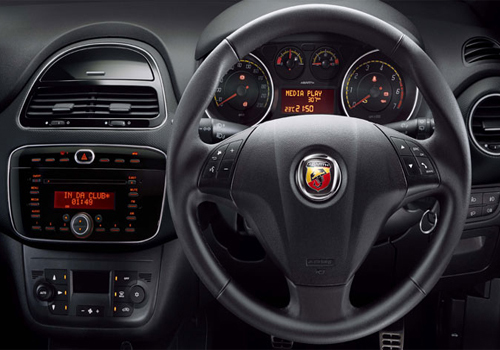 Interiors are almost carried from Fiat 500 base version, of-course with high quality upholstery and sabelt seats.